Han Solo is married? Does Leia know?!? The Star Wars comics take place right after Episode IV – A New Hope, so the characters are still fitting into their new roles. Luke feels lost without Ben, Leia is trying to lead a rebellion while still dealing with the loss of her home planet and Han Solo is, well, being Solo. Currently there are four different titles on the shelves. Star Wars is the flagship title, Princess Leia is a 4-issue mini-series, Darth Vader is another ongoing title and Marvel has just started publishing Kanan (based on the Jedi character appearing in Rebels – which takes place at the end of the Clone Wars). The next title to hit the shelves will be called Lando and it is expected to be a mini-series telling an Oceans 11-like story set before The Empire Strikes Back. Recently a deleted scene from Star Wars hit the media about Han Solo having a girlfriend when we first meet him in the rear booth at the cantina. She is called Jenny and as shown in the photo above seems to be real close with Solo. The scene was cut from the film and Han Solo was free to mingle with the princess. 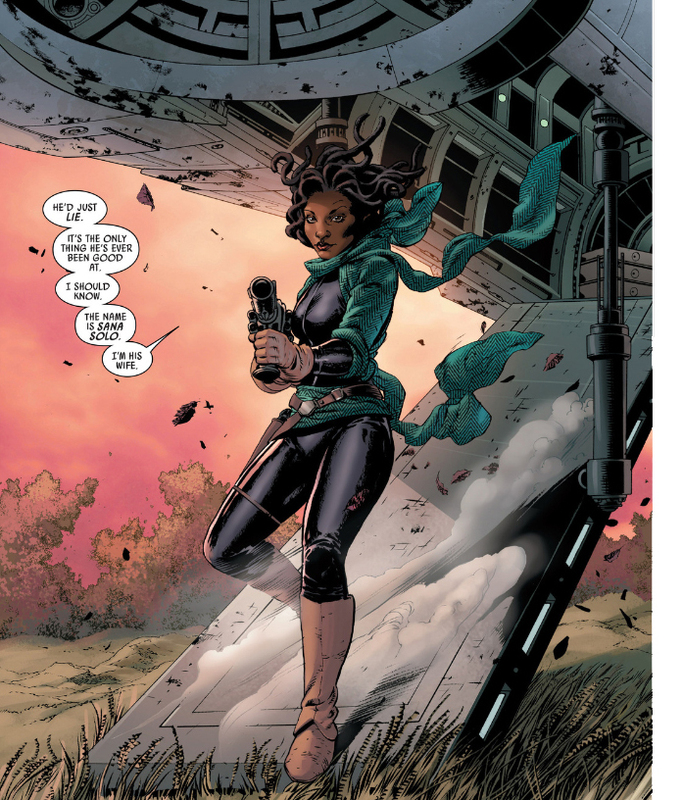 Now we comes Star Wars issue #6 and we learn that Han Solo has had a past. Along with card games with Lando, freeing Chewbacca from an Imperial Slave camp (which may or may not be canon as we’ll have to wait for the Solo-solo movie to learn the truth) and dumping illegal spice at the first sign of Imperials we now learn that there were other women before Jenny and Leia – or at least another woman. Meet Sana Solo, Han’s wife! (It’s important to remember at this point that Disney has said that any happening in the comics, novels, TV shows and future movies are all official canon). She has her own ship which looks a lot like the Falcon. She comes down the ramp already armed and looking for trouble. Han’s face as he watches the ship land tells me that there is going to be a wild story. Maybe Solo and Chewie dropped by the some Vegas-like spot and got stupid drunk and ended up marrying a complete stranger (yes, that was a Simpson’s episode). We’ll find out more about this marriage in issue 7, I hope. Myself, I’m getting tired of all of these changes and this is a huge change for the Star Wars universe. His name is Solo for a reason. I don’t believe it’s Han’s original last name, I’d like to think it’s something he picked up while serving in the Imperial army. Maybe he was stationed in one of the last barracks with older clones and because he wasn’t a clone he was given the nickname Solo. Who knows what the story is. Remember Chewbacca was given a family in the 1977 Christmas Special, but Lumpy and the others where quickly forgotten by George and the rest of the staff at Lucasfilm. Oh were we wrong! After announcing a new trilogy and so many stand-alone films that will kill the spirit of even the most die hard fan, Disney/Lucasfilms decided that the Expanded Universe (35 years worth of comics and novels along with the cartoons Droids and Ewoks) was no longer considered canon. Disney announced that the only Canon from the Lucas-era to survive the “Disneyfication” were the original 6 movies (their enhanced versions) as well as the TV Shows Clone Wars and Rebels. Everything else was gone. Forget about it because it never existed. Disney also announced that the comic license will return to Marvel (also owned by the House of Mouse) after being with Dark Horse Comics for 15 years. I was worried immediately because the last time Marvel had the license the art was dreadful and there was a 6 foot tall rabbit called Jaxx fighting along side our heroes. The new Marvel comics as well as all of the novels released after the purchase would be considered canon. I’ve read everything released thus far and most of it is pretty good but to paraphrase See-Threepio, “Disney has gone too far!” Of all the changes we fans have survived Star Wars issue #6 is by far the worse! Fans have been dealing with dozens of silly, pointless changes over the last (almost) 40 years. I hope this change doesn’t last too long because this weakens Solo’s character almost as much as Greedo shooting first. Oh, and for the record, 20th Century Fox still owns the distribution rights to the original 6 films, therefore don’t expect Disney to release any new (or original) versions of the original films any time soon. I still have the original VHS version of Star Wars (released in 1980). Now if only I still had a VCR. Steve Feek is a Geeks & Beats listener and can be found most weeknights in Toshi Station drinking himself blind with Cantina scum and bitching about the climbing cost of power converters.